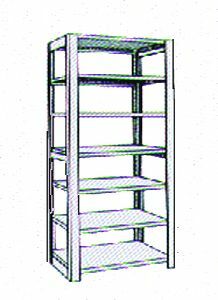 Ancom's 42" Add-On Four Post Steel Shelving by Tennsco with 7 tiers and adjustable dividers is available in legal size storage. 42" shelving design consists of uprights, shelf supports, backstops and shelves with adjustable dividers. Standard Widths: 36 in., 42 in. & 48 in.